Remember getting party favor bags at kids' birthday parties? I always thought that was one of the best parts of any party. Even if the bag just had some Gak (remember Gak?!) and crayons, it was crazy exciting to get a little mystery bag of toys. Anyway, I think subscription boxes are basically the adult version of party favor bags. There's a total joy to opening a package and not knowing what's going to be inside. We had the opportunity to try out Surprise Pawty's St. Patrick's Day-themed box in March—and it was basically a magical puppy party favor bag. 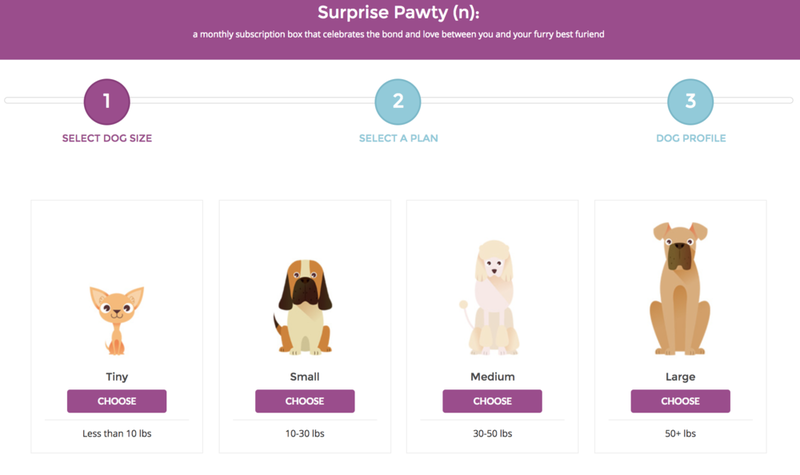 Surprise Pawty is a dog product subscription service that curates themed boxes of dog treats, toys, and gear. To order a box, you have to tell Surprise Pawty all your pup's information. Then, they send you a hand-selected group of pup products based on one of their seasonal themes. Subscriptions start at $35 for one box, or you can pay $32 per box for six boxes. If you can't tell from Dave's ecstatic face in the pics, he loved it. Apparently, pups like party favors too. Have you tried Surprise Pawty? What did you think? You can get 15% off your first box with code DAVE15. *We received a free Surprise Pawty box in exchange for our Instagram posts, but this is not a sponsored review.